fleabag57 has no other items for sale. 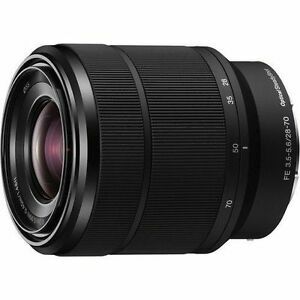 With 28-70 mm zoom, this Sony SEL lens offers sharp, wide-angle to mid-range focal length imaging and is designed for Sony E-mount mirrorless cameras. Featuring OSS image stabilisation and maximum aperture of f3.5 (f5.6 at full zoom), the lens enables impressively bright and sharp image quality. In addition, its auto and manual focus capabilities make this lens highly versatile, and its robust construction will ensure many years of trouble-free use. Good lens, easy to carry and with high quality about too. I mainly used it for short filming, smooth focusing, very silent auto focusing, excellent choice, sharpness is ok sufficient for normal use. Nice product even makes me fells it is a new one instead of a used one.